West had a chance encounter with the creator of the piece, Lakota artist Keven Pourier, at a conference in Tulsa, Oklahoma, in 2017. Pourier, known for his work with buffalo horns and his ability to blend traditional materials with a contemporary aesthetic, showed Dakota Floral to West. She admired the contrast of the intense jet-black shine of the buffalo horn with the more delicate floral inlay pattern made from mother of pearl, lapis, malachite, sandstone, turquoise, coral, and pipestone. Significant as a vessel made from the horn cap of the buffalo, an animal revered for its power and for the resources it has provided to Native cultures for centuries, Pourier further notes, “The floral design is so beautiful and represents all the medicines that we used and still use today. The Buffalo Spirit lives in the horn cap.” The artwork embodies Buz’s role as a physician and healer in his own right as well as his generosity and compassion. 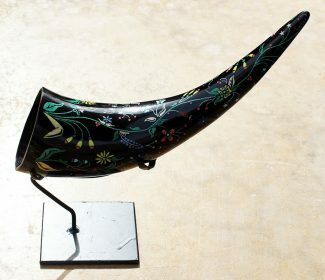 Dakota Floral Horn Cup was awarded first place in the Northern Plains Indian Market Art Show in 2017 at Sioux Falls, South Dakota. As of mid-May 2018, it is on exhibit in the Contemporary Native Arts Gallery on the lower level of the Plains Indian Museum.